'Sigmund' and Other Krofft Shows Resurface on DVD Sid and Marty Krofft created some of television's most memorable hits -- and disastrous flops. The Kroffts are experiencing somewhat of a resurgence as their shows -- including H.R. Pufnstuf -- are re-released on DVD. Sid and Marty Krofft created some of television's most memorable hits -- and disastrous flops. They were best known in the '70s for psychedelic Saturday morning kids shows. Among them, H.R. 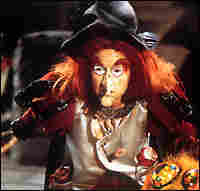 Pufnstuf, the story of a boy, a magic flute and a dragon with white boots and a Southern drawl. The Kroffts also created primetime song and dance programs, including the Donny and Marie Show. Jimmy introduces his golden talking flute in the show's first episode. The Kroffts are experiencing somewhat of a resurgence as many of their most famous creations are re-released on DVD. Sid and Marty Krofft kids' shows were colorful live-action cartoons. Real actors played opposite an array of talking creatures and inanimate objects. There was Lidsville, a land occupied solely by hats that walk, talk and sing. Sigmund and the Sea Monsters told the story of two boys and their friend -- a pile of seaweed that washed up on the beach. The most famous Krofft kid's show was H.R. Pufnstuf. The Krofft shows all had two things in common. They were colorful and a little bit weird. Most of the Krofft characters were larger-than-life puppets. 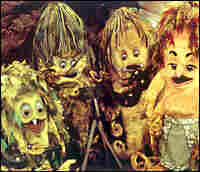 The brothers Krofft came from five generations of puppeteers. But Sid and Marty went beyond puppets. They also struck gold with variety shows in the mid-70s. The Kroffts ventured into primetime with Donny and Marie Osmond. Their variety show was a big hit. They scored again with yet another variety show -- this one featuring country music superstar Barbara Mandrell. In between there were some unfortunate creations, like The Brady Bunch Variety Hour. But the Kroffts have been resilient. Right now, they're developing a Pufnstuf movie. They're also working on a big-screen version of their science fiction series The Land of the Lost. 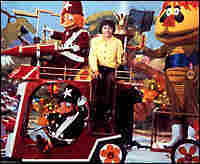 The theme song for the show sets up the conflict — between the boy, Pufnstuf and the witch — that drives the story.